Thanda wins WORLD TRAVEL AWARD for the 5th time! Thanda Private Game Reserve is thrilled to have once again been recognized as the World’s Leading Luxury Lodge at the World Travel Awards Grand Final Ceremony. Voted for by travel and tourism professionals worldwide, this impressive accolade recognizes the commitment to excellence, which Thanda has demonstrated in the last twelve months. 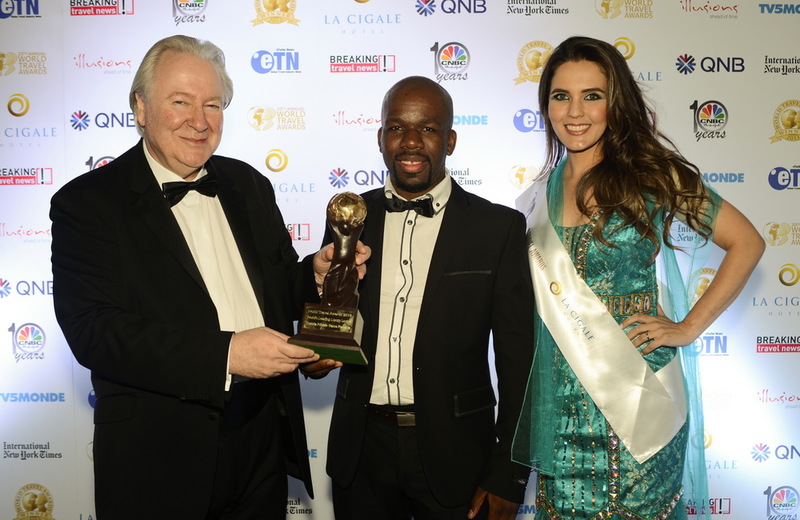 The prestigious event took place on the evening of the 30th November in Doha, Qatar, where Sphamandla Shabalala, Manager of Thanda Safari Lodge was presented with the award before an invited audience of the industry’s leading luminaries and the international media. The 5th consecutive time to have won this particular award, Thanda has regularly been distinguished at the World Travel Awards for its exceptional accommodation offering, superb guest service and warm Zulu welcome. The picture shows Graham Cooke, President and Founder of the WTA, presenting the award to Sphamandla Shabalala, Manager of Thanda Safari Lodge.